Please Note that all of my Work is created by Myself, an Artist, & NOT by employees, or on a production line. You'll receive a Formal "Letter Of Authenticity" from me when the Chandelier is Shipped. This is for your Records, & Insurance Company. Crating & Shipping will be calculated when order is completed. 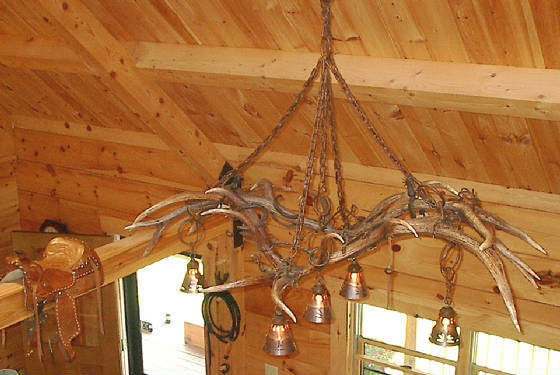 My Custom made Elk Antler Chandeliers are Created using 2 sets of Elk Antlers Sheds from Wyoming. Dimensions can vary. Average size is approximately 38” deep x 70” long. 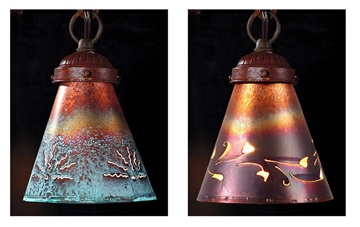 All are uniquely different in the style of Hardware I use, including Refurbished Rusted Horsebits, Horseshoes, Spurs, Heavy Chain & Decorative Hardware; including Conchos & Leather, as well as the Handmade Copper Shades. Your choice of Shades is shown, & all have a Clear Coat Protective Finish. Average time for Building is 4 to 6 weeks. $4,995.00. A custom create is built for shipping (approx. $275.00) and sent via Common Carrier. The cost for shipping is determined after the order is placed, and your zip code is submitted. This Fixture was Especially Designed for a Client to hang over their Dining Table. 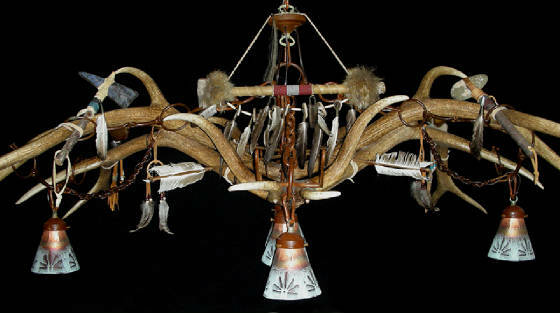 Their home is totally Decorated with Native American Indian Artifacts, & they commissioned me to build this Chandelier, incorporating the same style of pieces, which I purchased from The Navaho Indian Tribe. 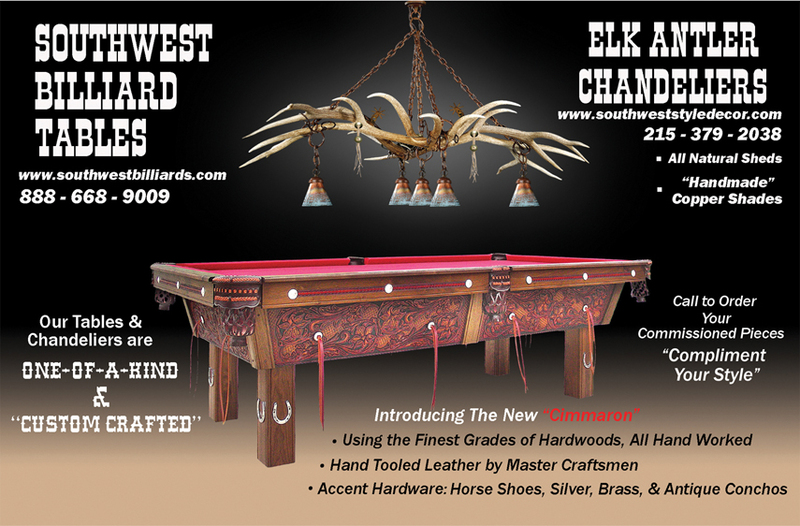 Shown are several Ads that myself & my Associate, Dave Hamrich, of "Southwest Billiards.com" (1-888-668-9009) have placed in the following Publications... "Cowboys & Indians", "Log Home Living" & "American Cowboy"
This Chandelier was created with exceptionally large Sets of Antlers, enabling me to add a 6th lamp. I was invited to Build & display a chandelier for a Sportsmen show in Salt Lake City in February 2008, for it to hang in the Dining Area of the Convention center. 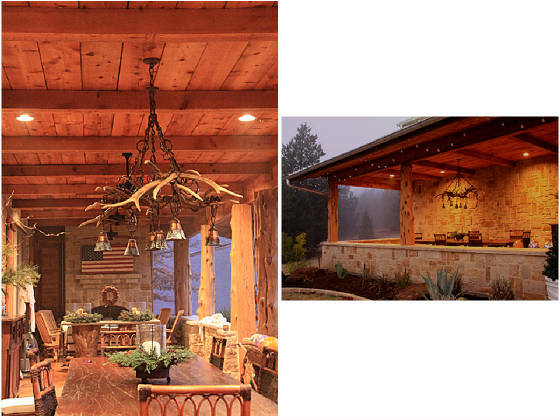 The Fixture was purchased for over a Dining Table in an outdoor Porch area in Rockwell Texas, & my Client took these photos just after her Electrician installed it. This chandelier was ordered from a client, Ray Vees, who had purchased a “fake resin” fixture from a large franchised sports store. After he looked at it hanging, he could not stand it. 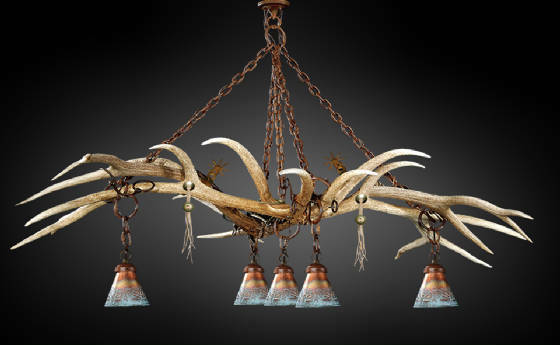 He had heard about my Custom Elk Antler Chandeliers, Contacted me after visiting my Web Site, and ordered an original. His testimonial can be read when clicking on the Testimonial Navigation button. Use PayPal for your deposit. Final payment will include shipping and handling required prior to delivery.